The tallest skyscraper. The deepest tunnel. The largest building. 2013 was a year of extremes for the construction industry, with new buildings, bridges, tunnels, and even the odd steel sarcophagus reaching completion all over the world. Below, you'll find some of our favorite building stories of year—ranging from architecture to infrastructure—listed in no particular order. As always, feel free to drop anything you think we missed in the discussion below! In April, the spire that will made One World Trade Center the tallest building in the Western Hemisphere was raised to the top of the structure, like a giant candle on a towering cake. We were at the construction site to watch the magic unfold. Istanbul opened the deepest undersea tunnel on earth this year, amidst accusations of unsafe conditions and sub-par emergency systems by engineers who point out that the tunnel runs through volatile seismic territory. Nonetheless, the tunnel now carries thousands of commuters across the Bosphorus every day. Tim De Chant weighed in with a definitive op-ed arguing about the infuriatingly ubiquitous trend amongst architects (and renderers): Drawing totally unrealistic gardens atop planned structures. De Chant's takedown—both technical and cultural—was one of our favorite posts of the year. We delved into a Chinese plan to build the world's tallest building this year, questioning the practicality of the design, and discovered the political and economic currents lurking behind the plan. In a year defined by questions about climate change and intensifying storms, this post was a great explainer on emerging ideas about the "living infrastructure" that could save cities from the rising tides. When Steve Jobs presented the initial design for his donut-like headquarters to the Cupertino City Council, in 2011, he described the building as a reaction against suburban office parks. "We've come up with a design that puts 12,000 people in one building; which sounds a bit odd," he said. "But we've seen these office parks with a lot of buildings, and they get pretty boring pretty fast. We'd like to do something better." The question, though, is better for whom? Nicola Twilley pointed us in the direction of a long-lost piece of "mythical subterranean meat infrastructure." The forgotten cow tunnels beneath Manhattan were once used to transport cows (and uh, steak) below the city's Meatpacking district. It's Official: The WTC Is the Tallest Building In the U.S.
At joint press conferences in New York and Chicago this fall, the Council on Tall Buildings and Urban Habitat—a Chicago-based nonprofit—announced its decision to crown the One World Trade Center as the tallest building in the United States, beating out the Windy City's Willis Tower by mere feet of spire. Geoff Manaugh and Michael Hession went deep underground this summer to visit the first complete Manhattan section of City Water Tunnel No. 3, after 43 years of work. The event was feted by Bloomberg himself. The AIA Finally Gave a Medal To a Female Architect. She Died In 1957. Alissa Walker reported on a long—embarrassingly long—overdue event in the architecture world: The American Institute of Architects, the largest and most influential architecture organization in the country, finally awarded its first Gold Medal to a woman. Surely the most tragicomic architectural event of the year, a new London skyscraper began reflecting sun into an insanely powerful "death ray" that melted nearby cars and fried eggs. Architect Rafael Viñoly's explanation: "We made a lot of mistakes with this building, and we will take care of it." At 1.7 million square meters and 18 stories, this Chengdu shopping complex—the New Century Global Center—became the largest building ever constructed this year. The tallest prefab building in the country—and maybe the world—took shape in a nondescript warehouse in Brooklyn this year—Gizmodo had the chance to visit the space and watch it come together. We kept a close eye on a supertall building boom happening a few dozen blocks uptown from us this year: At least four 1,000-foot-plus skyscrapers are rising along (or adjacent to) West 57th Street in midtown Manhattan, sparking debates about the divide between the city's super-rich and the rest of New York. One marker of California's small but booming solar industry? The opening of the Ivanpah Solar Electric Generating System, the largest thermal energy system of its kind. 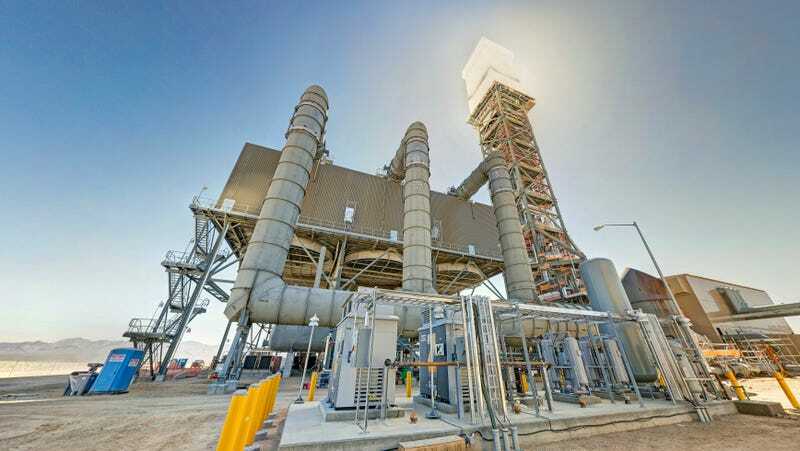 This 377-megawatt, 3,500-acre site is located in California's Mojave Desert, and it's ridiculously big. As the United Nations wrapped up its 68th General Assembly this year, designs for a new building called the UN Consolidation Tower were also revealed: The 36-story tower will house almost 3,000 employees, offer much-needed emergency overflow space, and make the UN more secure as a whole. The world's largest tunneling machine ground to halt below Seattle this month, unable to continue its work because of a mysterious, er, object blocking its path. Ice-age boulder? Old train engines? The remains of a dinosaur? You decide! Finally, amidst so many stories about the future of cities, we also had the change to look back at the megastructures that were one slated to be built—but, like so many grand plans, were abandoned when reality set in. Here's to a 2014 filled with new supertalls, new discoveries about what's underneath our cities, and of course, plenty of new tunnels.